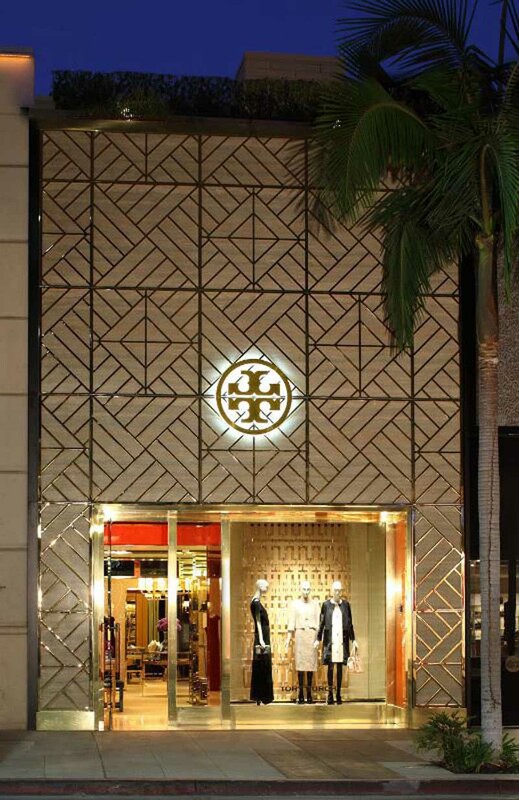 LOS ANGELES, Nov 12, 2013/ — Just in time for the holiday shopping season, Tory Burch opened its first West Coast flagship at 366 North Rodeo Drive in Beverly Hills in November making this the company’s fourth boutique in Los Angeles and the 13th in California. In celebration of the opening there will be a home collection exclusive to the Rodeo Drive flagship, including needlepoint pillows, brass frames, handmade boxes and pieces for entertaining. The entire Tory Burch collection will also be available, including ready-to-wear, handbags, shoes, jewelry, small leather goods, swimwear, accessories and the new fragrance and beauty collection with Estee Lauder. Reflecting the easy glamour that defines Los Angeles, the three-story, 4700-square-foot space has been custom designed by Tory Burch and architect Daniel Romualdez to create a residential feel. A brass fretwork facade inspired by Chinese Chippendale sets the tone for a beautiful and intimate interior where abaca rugs, brown lacquer walls and cane tables provide a neutral backdrop for seafoam drapes, teal velvet sofas and blue-and-white porcelain. Decorative elements feel elegant yet laidback — gold leaf peony wallpaper mixed with white coral sconces; a Madeleine Castaing carpet in an oak-paneled room; and a velvet sofa under an antique tile mirror Tory discovered in Morocco. The flagship has several unique spaces as well, from a private VIP room for shopping to a terrace with a working fireplace and living room, blurring the line between indoors and out.